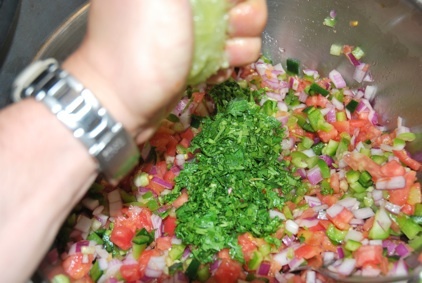 Typically salsa may refer to any type of sauce. 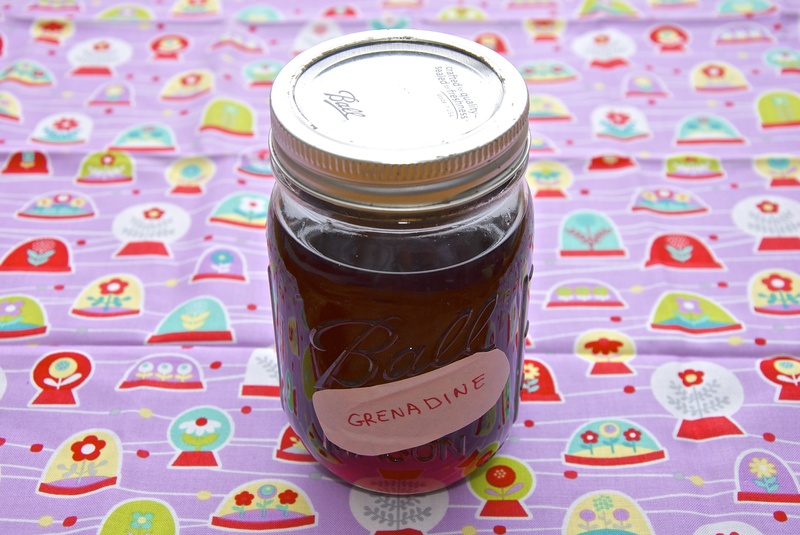 The origin of the word is spanish and means sauce. 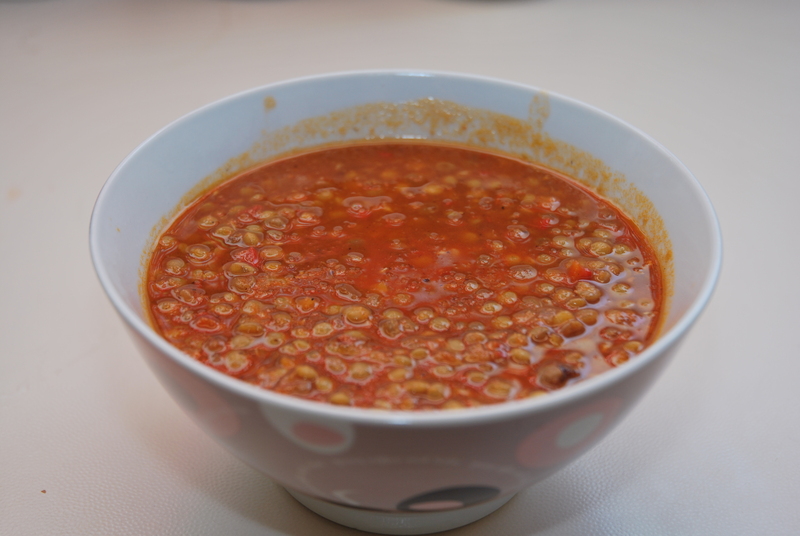 In American English it usually refers to the spicy, often tomato based hot sauces typical of Hispanic cuisine, particularly those used as dips. 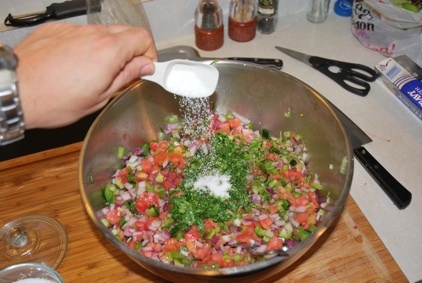 Most commonly however is used to describe the pico de gallo sauce, which is a mixture of finely diced veggies including but not limited to tomato, pepper and onion. 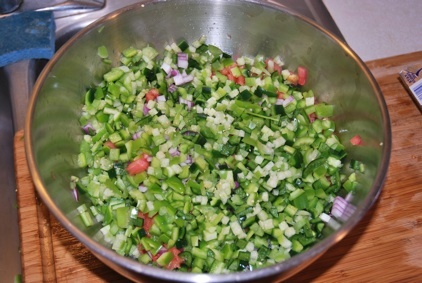 But in general in can expand to include anything you want from hardy veggies to fruits. 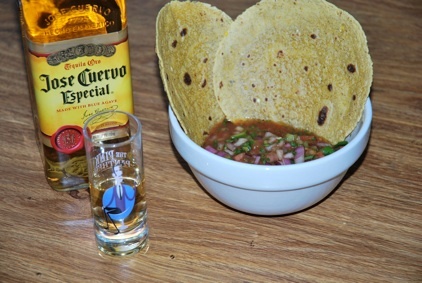 They way I see salsa there are three components. 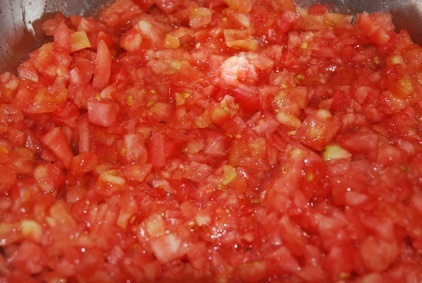 The base: Usually consisting on tomato bell pepper and onions. 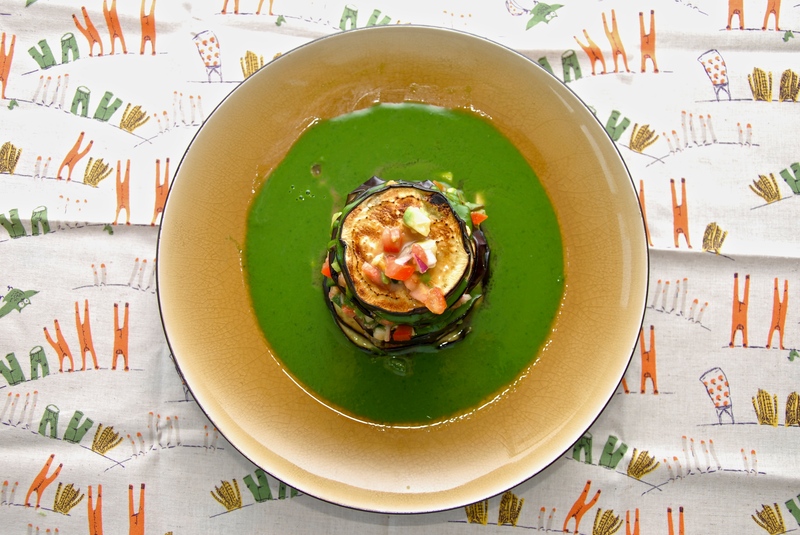 It acounts for 80% – 90% of the total salsa body and it is mildly hot from the onion. 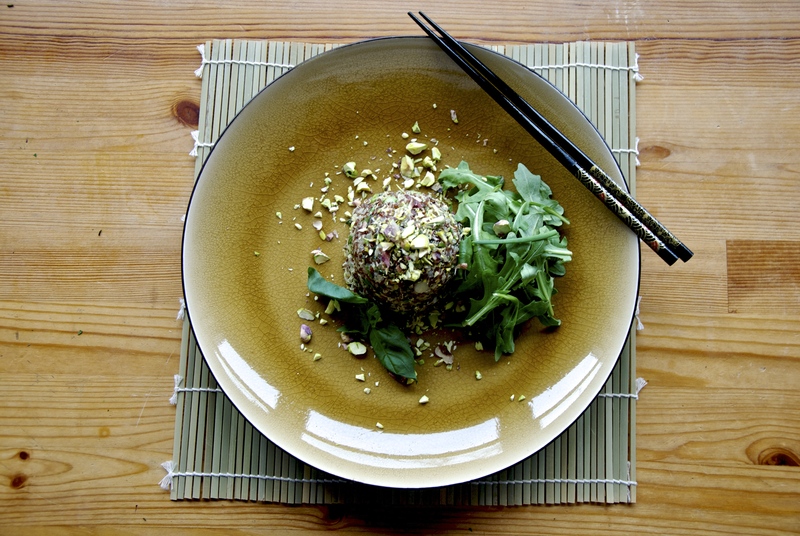 It can also be a fruit based body, like pineapple and mango or avocado. 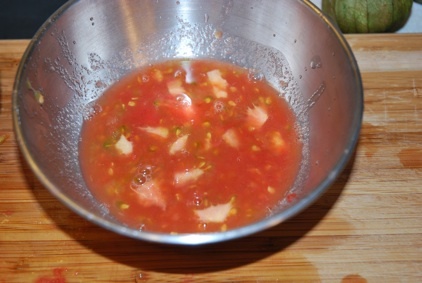 The punch: The additional vegetation that can include spicy peppers, corn, tomatillos, mushrooms etc. 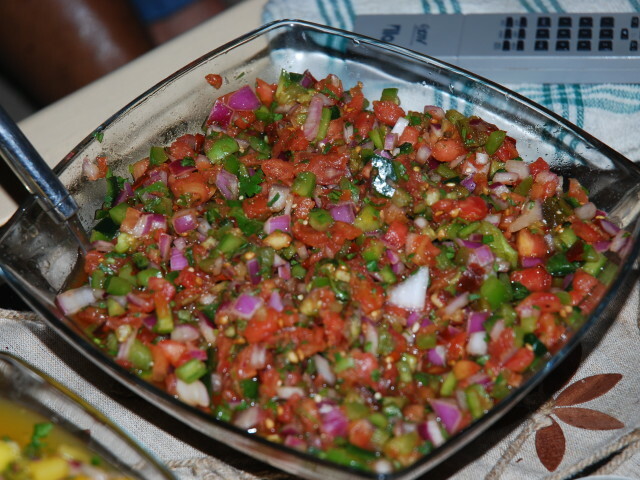 This is what will differentiate salsa from salsa. 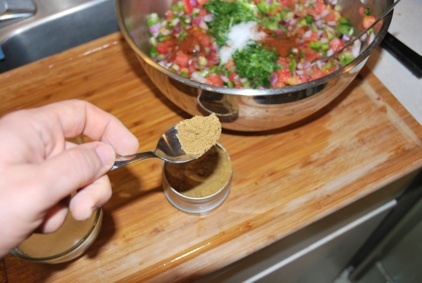 The pinch: The small amounts of flavorings, like spices, herbs and juices. 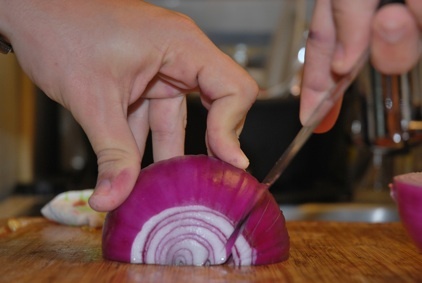 Here the chef can show his skills. 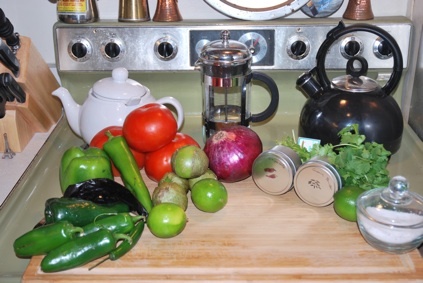 Small and moderate amounts will make a salsa with a better body, feel and taste. Larger amounts and the body is ruined. Only the spices are left. 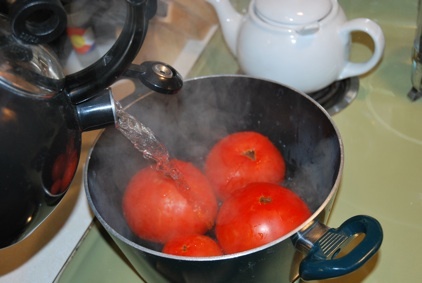 Start by bringing a kettle of water to a boil. Why? You will see. 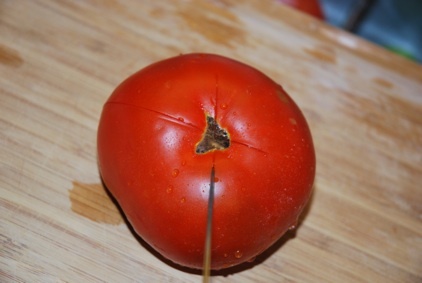 Score an X at the base of every tomato. 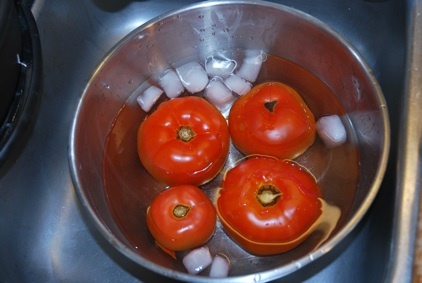 Pour the water on top and left them in there for 20-30 secs. 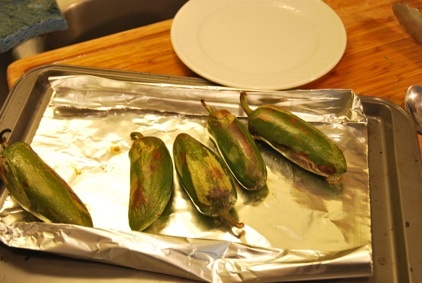 Transfer them in ice water and let them cool. 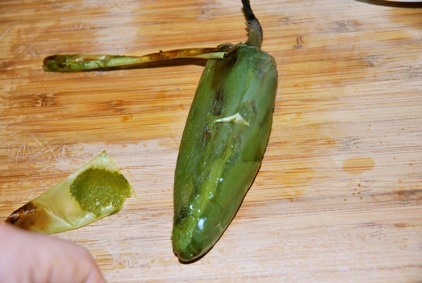 Once cooled the skin will be pealing right of. Once everything is done we can continue with the actual cutting. 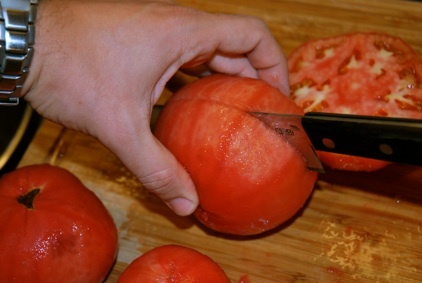 Cut the tomato at the equator. 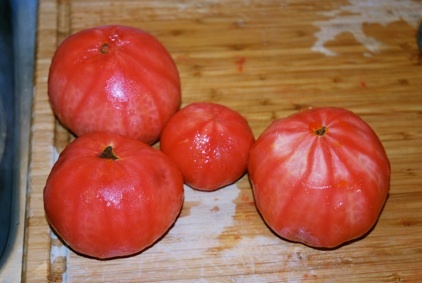 This will expose the inert of the tomato. 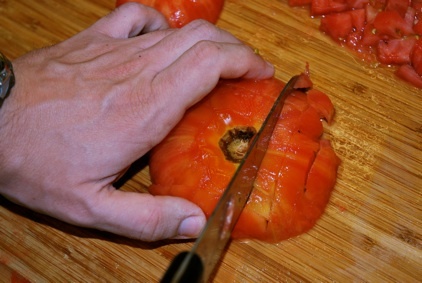 With a peri knife cut the little stem that holds the strawberry part of the tomato. 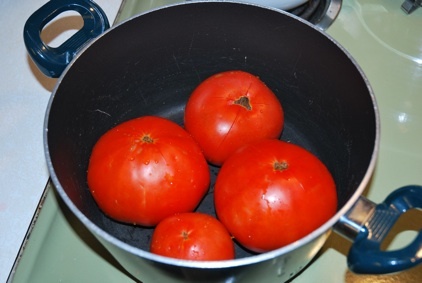 Empty the tomato guts in a bowl. We will need them but later. 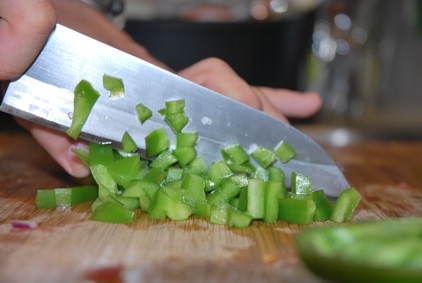 Go on with the dicing. 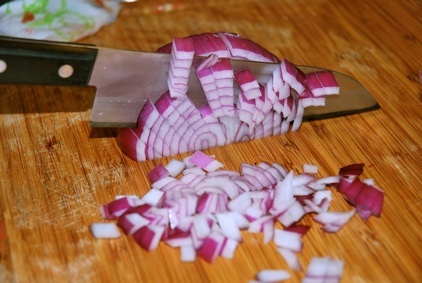 You might find useful to run the knife over the dices a few times to cut the in smaller pieces. 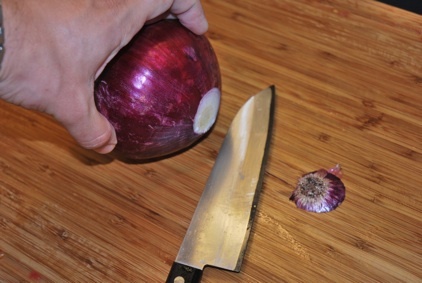 Once this is done turn your attention to the onion. Trim the root. And cut down a part of the top to expose the concentric cylinders. 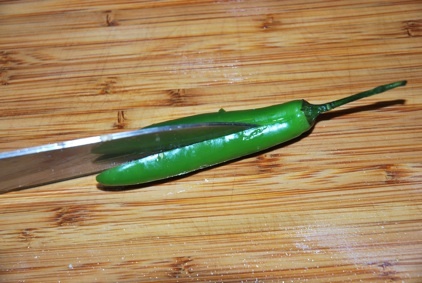 Cut it half from top to bottom. and proceed with radial cuts. 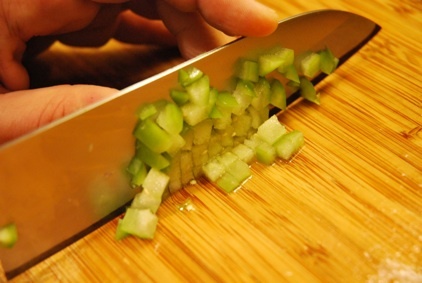 Follow them with more vertical cuts, perpendicular to the previous. Tun our attention to the pepper. 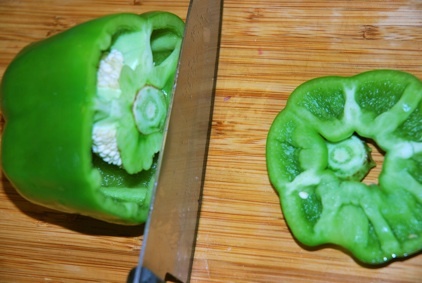 Cut the top and pull out the seeds. 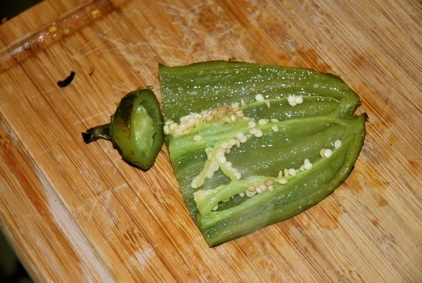 Quarter the pepper and with the tip of the knife remove the glands, the membrane that holds the seeds. 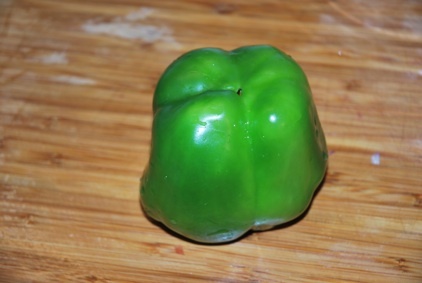 Jullien the pepper. That is is french for cutting it into sticks. 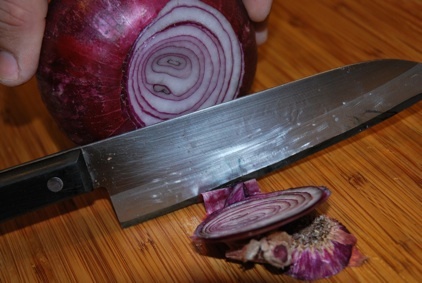 Cut them in pieces just as you did with the onion. 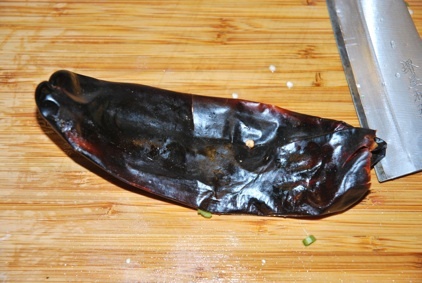 Repeat with the other two peppers. 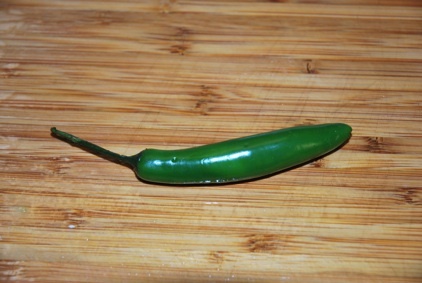 Not the poblano and the jalapeño. Hold on them. 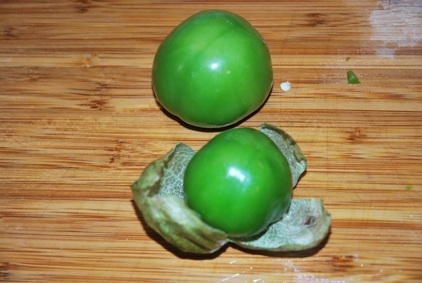 Let’s look at the tomatillo. 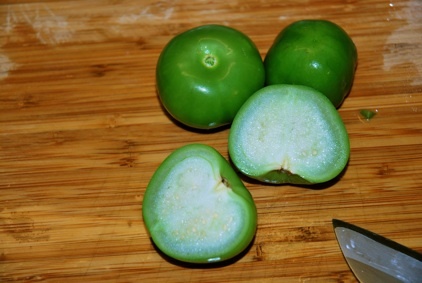 It is named tomatillo due to the visual resemblance to the tomato. In reality however, they do not share anything. Distant cousins. Remove the husk that surounds them and wash them. 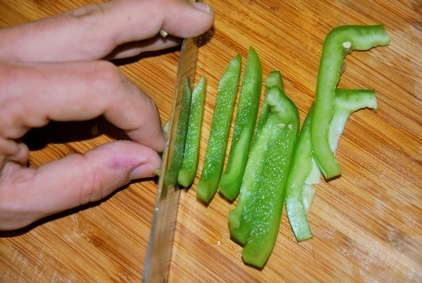 Cut lengthwise. There is nothing to remove from here. It is all good and yummy. Slice your way through it. Take the serano. It will be the major heat source. We will dice it very finely and use it wisely. 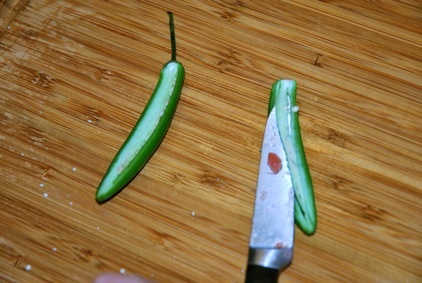 With your peri knife remove the seeds and scape of the white membrane. This is the major source of heat. Then proceed as before. 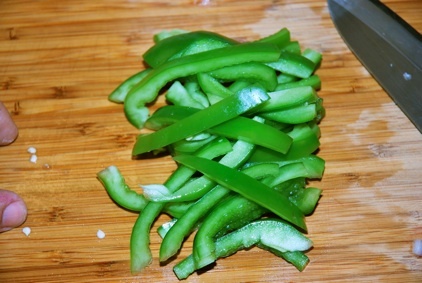 Here you can see all the cut veggies. In beautiful layers. 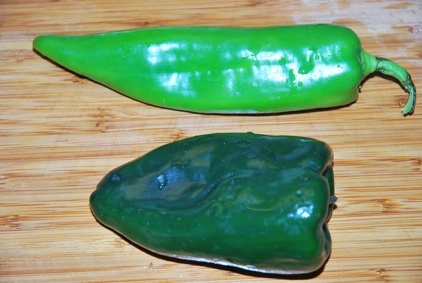 The poblano is just the dried version of the Anaheim pepper. It is very leathery and dry. 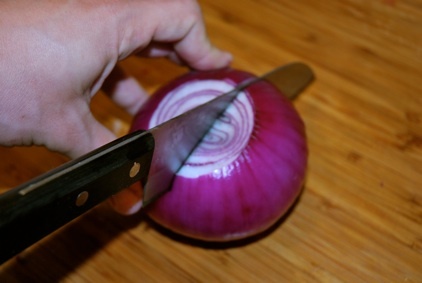 VEry hard to cut with a knife. So I just use a pair of scissors. 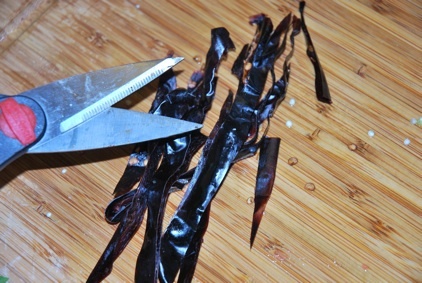 Cut them in strips. 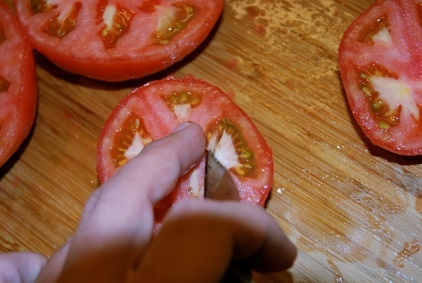 Gather up the strips and cut the again with scissors, in the reserved tomato liquid. 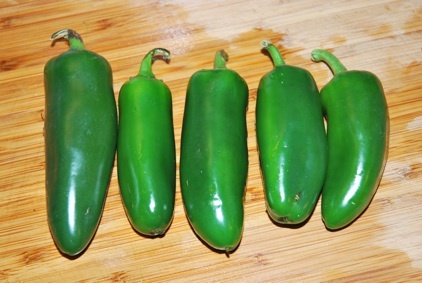 Take the five lovely jalapeños and after washing coate them with a thin oil coating. 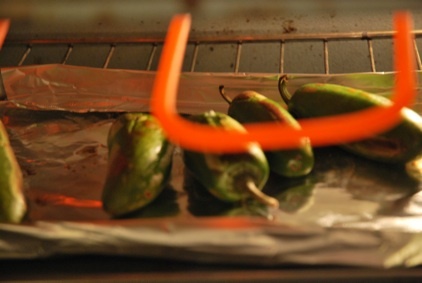 Place them under the broiler keep a close eye on them. 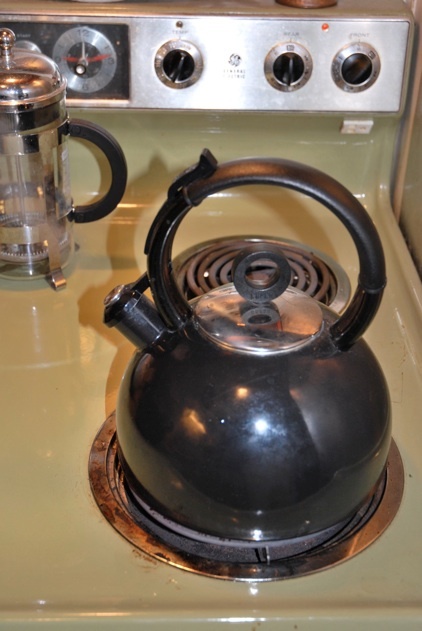 If you have a gas stove do it directly over the flame. 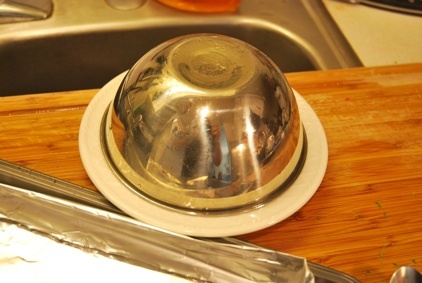 And cover them with a bowl metal or glass. 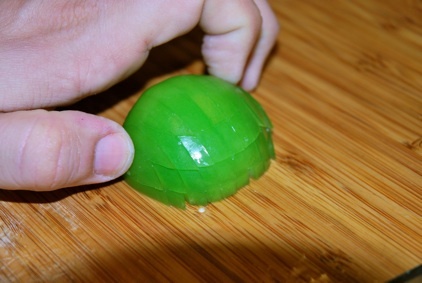 The trapped steam will loosen up the skin and will make it peal easy. The skin is coming off in big chunks. If there is some left behind is good. Nothing to worry about. 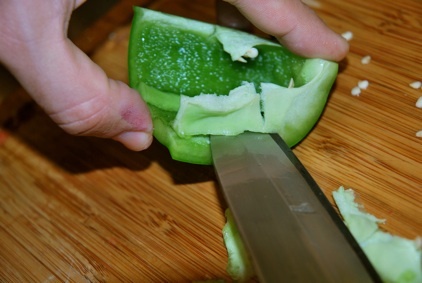 Cut the stem part and open them. 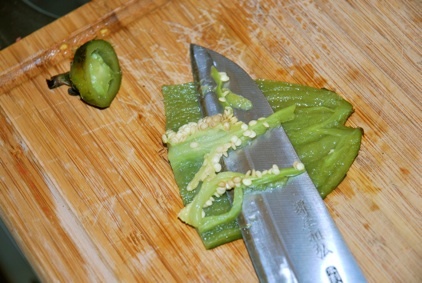 Pass the knife slowly to remove the seeds and the membrane. The just follow as we did before with the other peppers. 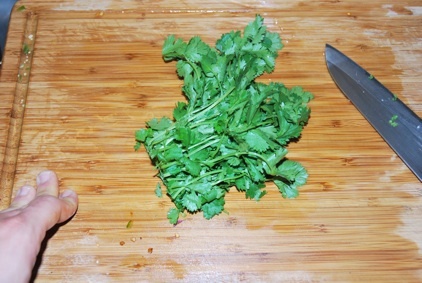 Cut the cilandro, as fine as you can. And zest them. 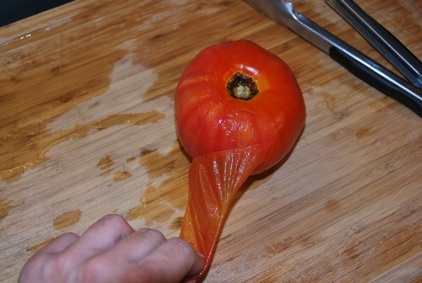 Ok, technically zesting comes first. I just did it the wrong way. 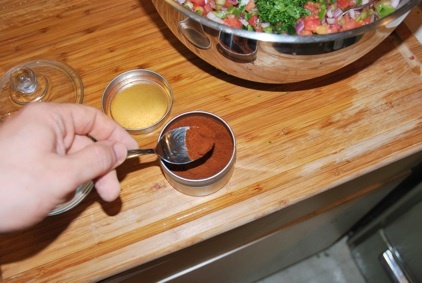 Half teaspoon of chipotle powder. 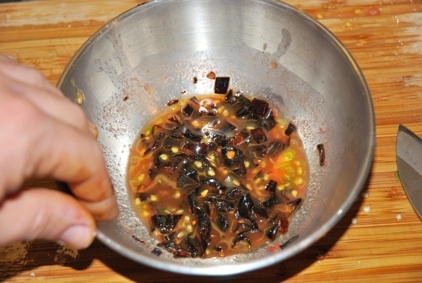 And finally add the reserved juice with the hydrated poblano chillies. 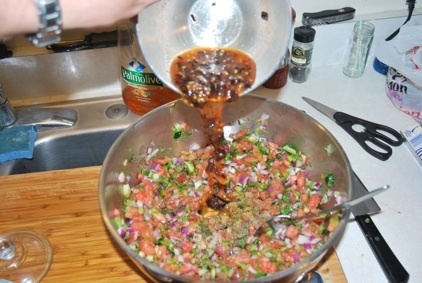 Mix everything together and chill for at least 2 hours in the refrigerator. 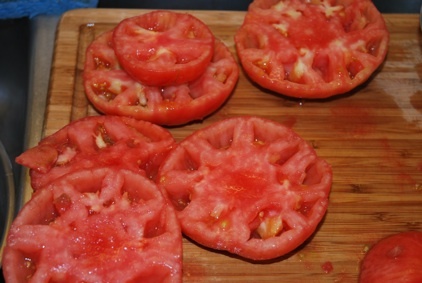 I like mine with all the juice that comes of the tomatoes (real refreshing), and real corn tortillas. 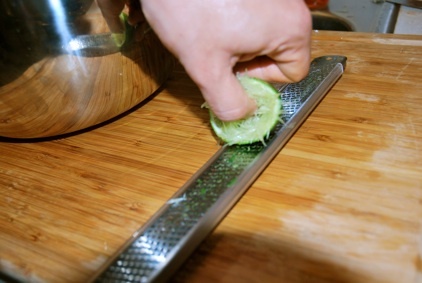 Tequila is optional but helps bring out a lot of the flavors like the chipotle and the jalapeño.